Professor Ryan Carnegie and marine scientist Nancy Stokes sort oysters at Aberdeen Rock on the York River in spring 2011. Credit: Photo by Rita Crockett/VIMS. Development of disease resistance among Chesapeake Bay oysters calls for a shift in oyster-restoration strategies within the Bay and its tributaries. That's according to a new study by researchers at the Virginia Institute of Marine Science (VIMS). The study, by professors Ryan Carnegie and Eugene Burreson, is the feature article in the most recent issue of Marine Ecology Progress Series. 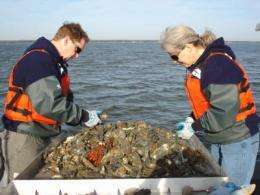 It is based on 50 years of VIMS research into the prevalence of MSX disease among the native eastern oyster Crassostrea virginica. Carnegie, a Research Assistant Professor in the Shellfish Pathology Laboratory at VIMS, says "Our results point to substantial reproduction by disease-resistant oysters in the high-salinity areas where the parasite causing MSX thrives. We thus argue that reefs in areas of higher salinity should be the focus of conservation and restoration efforts, not just those in disease-free lower salinity areas." 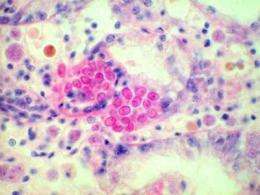 This is a histological image of Haplosporidium nelsoni (MSX). The pink refractory bodies are MSX spores in oyster tissues. Credit: Image courtesy Eugene Burreson/VIMS. Carnegie and Burreson's research, however, paints a different picture. They've found clear evidence that oysters in the Bay's saltier waters are developing resistance to both MSXthe focus of their paperand Dermo, despite the increasing prevalence in the Bay of the parasites responsible for the two diseases. This is only possible through reproduction by resistant oysters in high-disease areas, thus their call for a focusing of restoration efforts onto these disease-resistant areas and populations. In fact, Carnegie and Burreson point out that restoration efforts focused on low-salinity refugia may actually be counter productive. Carnegie says "our study makes very clear what happens when oyster larvae from the low-salinity refugia settle in high salinity watersthey are removed quickly by the parasites because they are produced by genetically naïve parent oysters that haven't been selected for disease resistance." Genetic mingling of these susceptible oysters with their disease-resistant counterparts may be acting to slow the spread of disease resistance through the Chesapeake Bay oyster population.